I have tons of information about scriptural, dogmatic, theological matters, and miles of proofs for evolution, hallucinations, and scientiﬁc evidence. I won't share this with them anymore than Dawkins will debate creationists, and for the same reason. They reject facts. Evidence makes them uneasy, troubles them. (And evidence even discomforts those who have been in the habit of rejecting it, even as they are leaving their faiths behind.) I cannot get through to those who have their minds made up, who are sticking to what they believe in, evidence and rationality be damned. But, belief = belief. So? When we make the assertion that, just because something's in a book or books, that doesn't make it true, we threaten that “theological authority.” We throw the question “How do you know it's true?” right back, like a high velocity jai alai ball. Really, if such “book-truth” is a basis for serious belief, there are even more serious questions asking why. To boast that, “It's in the book, so it can't possibly be wrong,” is stupid, and to insist that one must believe that claim to be saved from being tormented is insulting and demeaning to common intelligence. Please! A commentator on this site once made a profound observation about scripture writers and free will. He said that if you ask a believer why God allows evil in this world, he will tell you it's because humans have free will. But, he asks, can't you also say that because of free will, those writers lied? What's to keep them from doing so? (Are they any different than dictators or propagandists, using their free wills?) The only way to judge them is by using reasonable arguments, the scientiﬁc method of ﬁnding proof, while considering the ignorant times they were writing in. Aren't those who pick their verses to support their personal prejudices only doing what the writers themselves did when writing them? Yes, we can entertain the fact that those with agendas must “freely” lie when their ends justify their means. If we pursue the lying argument, some overlooked and unquestioned things become obvious. Such as, “These things were written so that you will believe.” And what of the forty days of Jesus, isolated in the desert, and his experiences/conversations with Satan? Where was a witness to them? And what of Mary’s private visit by an angel and the ensuing conversation? No witness there, either. What of Jesus’ prayers in the garden of Gethsemane, while his disciples were asleep all that time? Who heard and related those words? Oh yes, a donkey, and not just any donkey, but the one he rode into town on the previous week. (See, even I can be an apologist.) And of course there’s, “In the beginning.” As if the writer saw all those creations! The script writers look you in the face and lie their asses off, but because they’re writing “infallible“ words of a god, you'd better believe them! Ah, tradition. “How do you know that what you believe is true?”Shall we stop at scripture writers, and ignore their transcribers, who likely got bored after copying the same old, same old, over and over, and added their own embellishments to the texts? And what of those without reading glasses, who put in their own blurred readings? Shall we stop there and ignore the clergy with their own agendas, for example, those of the council of Nicaea, deciding what is “true” or not, for their own political gain? Are the gnostic gospels any “truer” than their choices? Or any less false? What if the whole tradition of religions is a tradition of lying? Think about dogmas. They are, judging by the writers themselves, traditions, hearsay, eyewitness reports. These claims are unsubstantiated by historians. What does that tell us? Life experience tells us to beware of being too credulous, to avoid being naive and gullible in the face of outrageous claims. The danger with the claims of religions is that they can all be repeated lies (tradition), and that any lie eventually becomes dogma, which means it cannot be rescinded even in the face of obvious proof to the contrary. Lying has created the tangled webs we see when our eyes are open to pursuing the truth. Are not apologists by nature those who, in order to believe, must lie to themselves, basing their beliefs on the assumption that their sacred texts cannot possibly, ever, ever, be wrong? Is it an egocentric head trip for them to be consulted as authorities? Don't they even want to realize they need to think about what they're indoctrinated to accept as truth, or are they afraid to? Isn't anybody thinking outside of the rut they keep going around in? 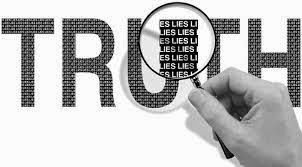 Are all clergy liars? Paula Kirby, writing for the Washington Post, created a long list detailing how individual pastors interpreted “God” for their congregations, based on their own personal feelings. Does this make truth? Based on what I personally have heard come out of the mouths of clergy over the years, I have to say that the difference between me and a believer is the fact that I don't trust the clergy, but the believer does. So, does truth matter, and how do we ﬁnd out what is true? It's not easy; you have to be a combination of investigator/prosecutor/defense attorney/archeologist/brain studier and psychologist, if you really care. Or you can read what those professionals have to say. You must be open-minded, un-dogmatic, if you really care. Then we can talk about what “true” really means. And that's the truth. No lie.